Card Text Play: Return a creature from your discard pile to your hand. Can I choose to not return a creature from the discard pile to my hand? No. You always resolve as much of an ability as possible. If you play Regrowth, you must return a creature to your hand, if possible. 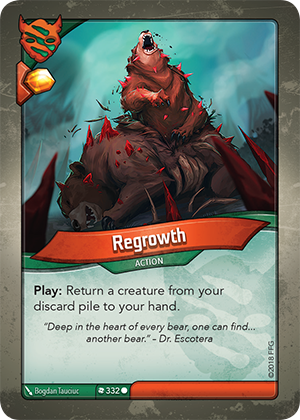 If there are no creatures in your discard pile, the “Play:” effect does not resolve and you still receive the Æmber bonus for playing the card.